Kirby has never been that kind of platformer that I would normally gravitate towards to. Something about the pink puffball, who can so easily inhale enemies and steal their powers, seemed almost villainous to me. More seriously, something that always put me off Kirby was the ease of it. Yes, it’s a game meant for kids, but there is still the potential to have some challenge involved. Mario and Donkey Kong games can be difficult and kids still love them, so why can’t Kirby? The story of Robobot starts of with something called the Access Ark invading the planet Pop Star. Both King Dedede and Meta Knight attempt to prevent the invasion yet their attempts are thwarted, leaving it up to the pink puffball to start sucking and save the day. 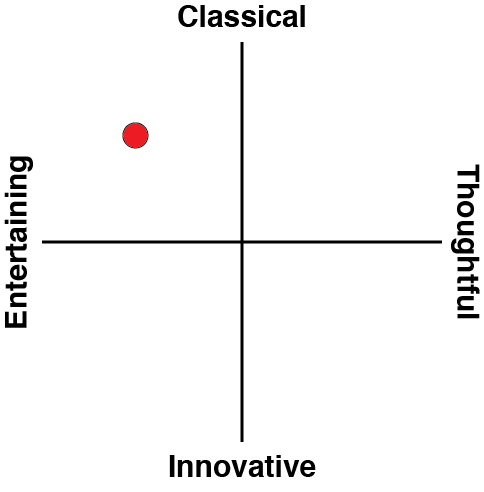 Although the clear threat is robots and mechanical terrors, there doesn’t seem to be that much wrong with Pop Star. 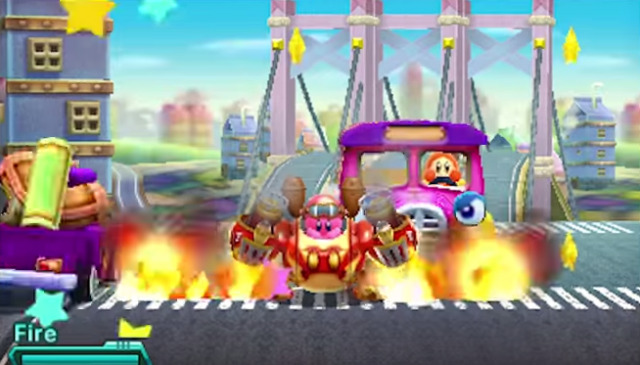 Most of the enemies that Kirby will face are the same foes he’s seen on his adventures before. That's a bit disappointing, to be honest. Nintendo could have invested in some more original enemy designs. The level environments are unique, and elements there are reused far less often, so to see reoccurring foes takes away from the individuality of the levels. Much of the gameplay plays similar to previous entries in the series. Kirby travels through 2D levels, encountering puzzles and obstacles along the way. Kirby can inhale objects, spitting them out with great ferocity, or swallow enemies, occasionally acquiring the abilities of the enemy he just consumed. It’s something that has made Kirby games, and Kirby himself, well known, as far back as the NES, when he had his first outing. Everyone is aware of the danger Kirby can pose in Super Smash Bros., being able to copy the abilities of foes and it’s the same here. There are a multitude of abilities to acquire, and while most simply change the appearance of Kirby, adding a hat or some other identifier, some abilities take the extra step and change how Kirby moves. Getting the Freeze ability makes Kirby ice-skate when running, where the Mirror magically moves Kirby across the platform. There are three new abilities that Kirby can use, Poison, Doctor and ESP, with both Doctor and ESP getting some fanservice vibes (looking at you Dr. Mario and Earthbound fans). This time Kirby is accompanied by a much larger and powered up mechanical sidekick. 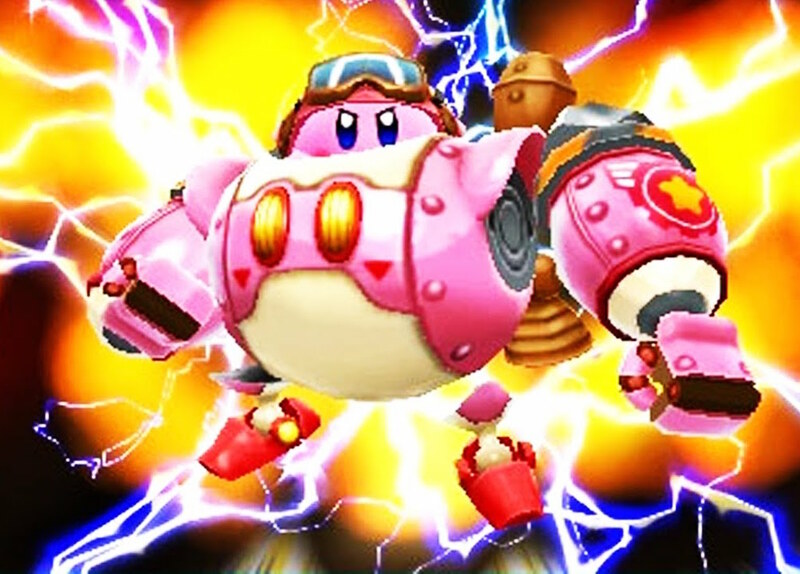 The mech, piloted by Kirby, is a new addition to the series, and brings some much need freshness to the game. In addition to being able to smash nearly everything that stands in your way, the mech, much like Kirby, can also copy abilities. Most transformations will adjust the two arms, with weapons coming out of both whether it be flamethrowers or swords. The mech can also transform into a Jet or a Car, which plays out in vehicular stages that are over too quickly and too suddenly. 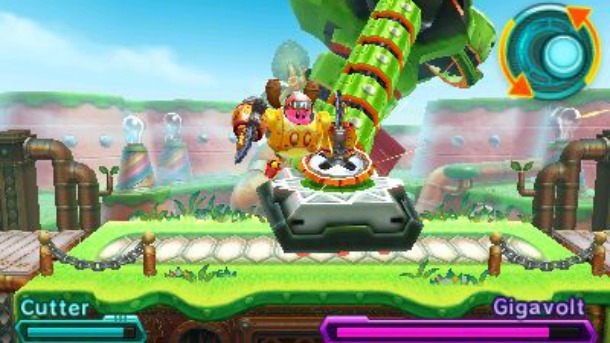 The robot can also tighten and loosen screws and bolts, changing the environment around Kirby, opening up previously unreachable paths Your robot companion isn’t around for the entire level, which is a bit of a shame, but it’s there nonetheless. The puzzles are simplistic, yet still enjoyable and satisfying to complete. Every puzzle nearly always centres around using or observing the environment around you. Unfortunately, as with the enemies, there's a lot of repetition in the puzzles. They’re not a mirror image, but there are only so many of the same puzzles I can take before I’m losing interest. For example, at the start of an area you’ve given clues as to what door to take. You have to remember these clues to get to a Code Cube at the end of it all. Changing what I have to remember doesn’t make me forget I’ve already done some variation on this before. Code Cubes are the main collectables in this game, with three in each level to collect. They act as keys, unlocking the boss level in each world. 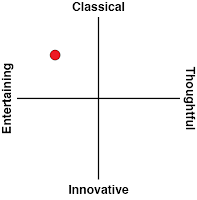 You can easily collect all three in each level, as every level is linear by nature. Some of the code cubes are hidden behind puzzles, and can be missed if you’re too quick to move through the levels. Collecting all code cubes in each world unlocks an extra level. The boss battles are really enjoyable and they take full advantage of the 2.5D environment. Depending on what abilities you have the bosses can be on the easy side, but they can be enjoyable when you don’t have any abilities, and have to rely on the boss to create opportunities to attack. Planet Robobot is an enjoyable time on the 3DS, even if it is a short one. And while the main experience is short yet sweet, there is enough side content for you to sink your time into. Multiplayer comes in the form of Team Kirby Clash, which pits up to four players against a boss, with every player having an assigned role. It’s a great game for the young ones, and still enough there for older players, but if you’re looking for a challenge, there are some stronger contenders on the 3DS.